Sometimes, a thoughtful gesture is all it takes to remind us how fortunate we are to be in our “neighborhood” of western North Carolina, where there are so many kind people. Since kindness is contagious, we thought we’d share a brief story about one of our kind neighbors. One afternoon this past week, by chance Dave saw a listing for free concrete pavers on Craigslist. Currently working with concrete molds to make decorative pavers and benches himself, Dave immediately expressed his interest (within 10 minutes of the listing being posted). The person listing the pavers, Mike, called back, and figuring that there were a couple dozen or so, Mike and Dave arranged for Dave to pick them up, to be used around our property… perhaps around our almost shovel-ready fire pit… But what nobody realized at the time (neither Mike nor Dave) was just how many pavers he had under his porch. Instead of dozens, there were hundreds, most of them in fine shape. Even though Mike had listed them for free, Dave offered to pay at least something for the substantial quantity of pavers he was taking (ultimately two pickup truck loads), especially since Mike’s wife mentioned that five other people expressed interest after Dave. However, Mike suggested that instead of taking something for himself, that Dave could instead make a donation to a charity that Mike and his wife feel strongly about: Smile Train. 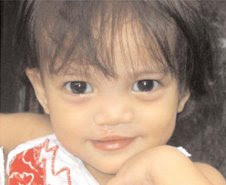 The mission of Smile Train is to provide free surgery to correct and repair cleft lip and palate deformities in children in 75 of the world’s poorest countries, and to also provide free training for doctors and medical professionals. Every donation matters because each surgery costs just $250. So, Mike, consider it done, and thanks for making us smile. It’s good to know we have such caring and thoughtful neighbors around us. This entry was posted in Uncategorized and tagged Black Mountain, improvements by Inn on Mill Creek. Bookmark the permalink. What an amazing way to transform a child’s life for such a small cost!